I began sewing rail fence strips together in a homemade "kit" that I received from someone to stitch up for charity. I really feel in love with the colorful blocks. I then made 4 patch squares with some additional scraps included in the kit. Placed side-by-side, they made a rather "busy" quilt, so I rotated the squares with plain black squares. I think it is rather striking! I am planning on adding a one-inch yellow strip around what is on the left as a first border. I would like to add black for the final border. However, that won't be enough to made this quilt twin-bed size. 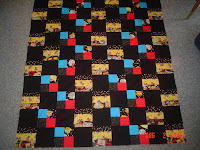 After I sew on the yellow border, I will "audition" other borders to see what will work. My daughter suggested adding two perhaps two or three inch borders in the red or turquose. I don't have those colors as these were all smaller pieces, but I could look for such colors in a quilt shop. I am also planning on getting suggestions from my quilt club later this week. I told dad that it looks like a butterfly with the black and bright colors! The turquoise really stands out, but the yellow and red look a little "washed out" in the photo.